Today, I made a birthday card. I like it so much and I hope you do as well. With this clean style and masculine colors, I will give it to my boyfriend, I'm sure he will enjoy it. First, I stamped the hoot from Art Impressions and embossed it. I colored it with Spectrum noir markers (see below for colors combinations). Added few sequins and some Stickles to the birthday hat. Looks much more festive! The sentiment was embossed in white and stamped on a Spellbinder tag die cut. 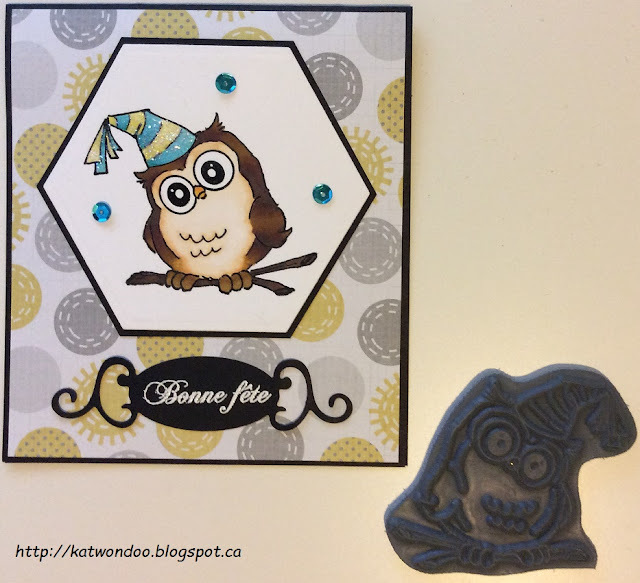 - Art Impressions challenge 182 : Show off your stamp! Oh I love you owl card its so cute. Your Hoot is adorable!! And I love the sparkly hat and touches of glimmer - glad to have you joining our "Show Us Your Stamp" Challenge at Art Impressions! Fantastic card! Thanks so much for sharing your talents with us at Art Impressions!